The Lost City of Z is an adaptation of David Grann’s non-fiction book of the same name. Expanded from the author’s 2005 New Yorker article, the 2009 hardcover became a New York Times bestseller and garnered over a half-dozen major awards and citations. 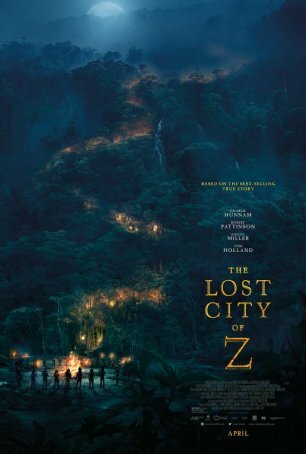 Part biography and part true life detective story, The Lost City of Z recounted the life and exploits of early 20th century explorer Percy Fawcett, who became obsessed with a mythical city in the Amazon that he simply called “Z”. Since many things about Z and Fawcett’s final mission remain shrouded in mystery, Grann’s novel looked at various scenarios and explored the available evidence. Although a documentary might have offered a straightforward interpretation of the book, director James Gray moved forward with a feature instead. This approach necessitated taking liberties with the text, not the least of which was condensing episodes from the protagonist’s life. The ending is muddled as an unsuccessful attempt is made to provide closure to a story that, if told frankly, shouldn’t have one. The movie opens in 1906 with the 39-year old Fawcett (Charlie Hunnam) traveling for the Royal Geographic Society to the wilds of South America to map the Brazil/Bolivia border. Accompanying him are two other British army soldiers: Henry Costin (Robert Pattinson) and Arthur Manley (Edward Ashley). Although several members of the expedition die, it is considered a success and Fawcett returns home as a minor celebrity (explorers being revered in the early 1900s). He is convinced that the remains of a great city exist within the Amazon awaiting a well-funded and determined mission to uncover them. Accompanied by another explorer, James Murray (Angus Macfadyen), who served on Shackleton’s 1907 Antarctic crew, Fawcett returns to the Amazon in 1911. This trip, although offering additional evidence of the existence of the ruins, fails to provide conclusive evidence and, when Murray falls ill with blood poisoning, an abrupt return home is necessitated. World War I breaks out, scuttling additional expeditions. It isn’t until 1925 that Fawcett is able to once again head into the wilderness, this time accompanied only by his son, Jack (Tom Holland). The Lost City of Z’s structure is problematic. Covering nearly 20 years of Fawcett’s life results in discontinuities in the character’s life and, although more than a half-dozen expeditions have been compressed into three, the movie rushes through each to get to the next chapter. There’s arguably too much material to fit into a 141-minute movie, especially presenting it chronologically, and there are times when The Lost City of Z’s approach feels superficial. “Green Inferno” movies (as they have come to be called) often rely strongly on a sense of atmosphere – something almost entirely absent in The Lost City of Z. Here, the Amazon isn’t some implacable adversary whose dense foliage hides unimaginable terrors. Instead, it’s camera-friendly scenery that allows the great cinematographer Darius Khondji an opportunity to display his skill. Gray’s arm’s length storytelling offers a coherent narrative but there’s little in the way of suspense or tension. The journeys are perfunctory, offering little in the way of adventure. Although it’s probably unfair to make a comparison with the likes of Apocalypse Now, Fitzcarraldo, and Aguirre, the Wrath of God, the Heart of Darkness journeys in those movies possessed a visceral power that The Lost City of Z never achieves. They were uncomfortable and immersive; The Lost City of Z seems inspired by them but its jungle scenes are indistinct echoes at best. On the home front, attempts to flesh out the loving relationship between Fawcett and his wife, Nina (Sienna Miller), are only partly successful and the resolution of the long-simmering resentment of Jack for his father is sudden and unsatisfying. Strong production values and a capable lead performance by Charlie Hunnam offset some of the film’s narrative issues but, although The Lost City of Z held my interest, it felt like a missed opportunity. Like too many biographical movies, this one tries to do too much. There are tantalizing glimpses of ideas that could have blossomed (obsession, patronizing Colonial attitudes, resource exploitation) but were nipped in the bud because of time constraints and a determination to concentrate on breadth rather than depth. The result is a collage of people, places, and events set in an era that seems foreign despite having existed only a century ago. Historical inaccuracies aside, the film provides an uneven but compelling portrait of one of the last members of a dying breed and gives us cause to mourn how technology has made the explorer extinct.